It's back to school time and so my kids just got new shoes. Of course for me this just means that I have new shoeboxes to play with. 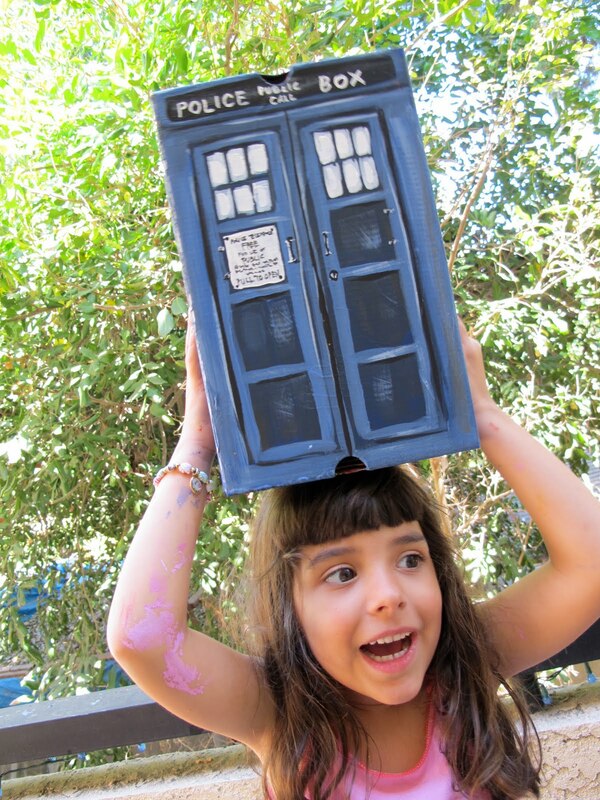 Lindsey at Filth Wizardry recently posted a DIY Dalek that she made with her kids. This got me thinking that my Doctor Who obsessed daughter might like a TARDIS for her barbie dolls. One of the shoeboxes in our recycling had a hinged lid and was already mostly blue, so I thought it would be an easy transformation. Holly painted the outside blue for me. I painted in the rest of the details and hot glued a cap onto the top for the Tardis light. Inside, Holly painted the orange and yellow background and helped me hot glue beads and buttons onto the console. Then we added lots of gold glitter. It's not quite "bigger on the inside", but I think it looks SMASHING! Especially with Holly's newly regenerated Doctor and his assistant, Rose Tyler. I know she likes it because as soon as it was dry she grabbed the dolls, stuffed it full of extra clothes and told me they were going on a long trip. Then she skipped off with the whole thing balanced on her head... Allons-y! I'm going to use this for my project!